Last week I gave you the "I can't believe these are healthy and taste so good!" brownie. This week I present to you the "this is so amazing I think I'm going to die" sinfully decadent tri-layered ganache/cookie dough/brownie, aka Chocolate Chip Cookie Dough Brownies. No, these are not the slightest bit healthy but yes they are every bit as wonderful as the combination sounds. Brownie? Please. Cookie Dough? Yes. Top it off with an extra layer of chocolate? Why not! 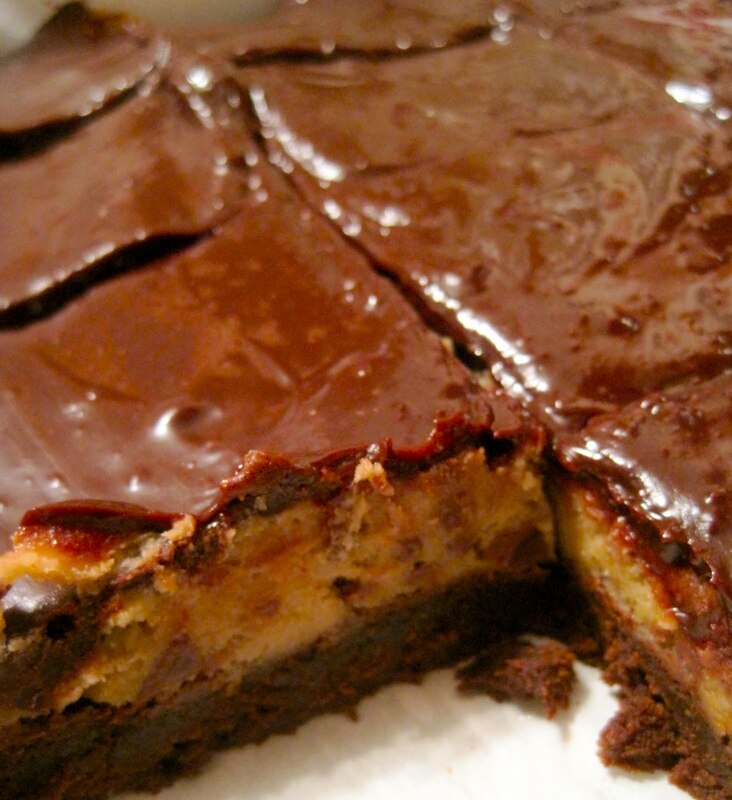 It's like someone mined through a pint of Ben and Jerry's Half Baked Ice cream, picked out every morsel of cookie dough/brownie batter and pieced them together in this dessert. The endless rain and sadness that summer is officially over put me on a baking spree, but I have to thank the recipient of these superbrownies (Happy Birthday Alicia!) 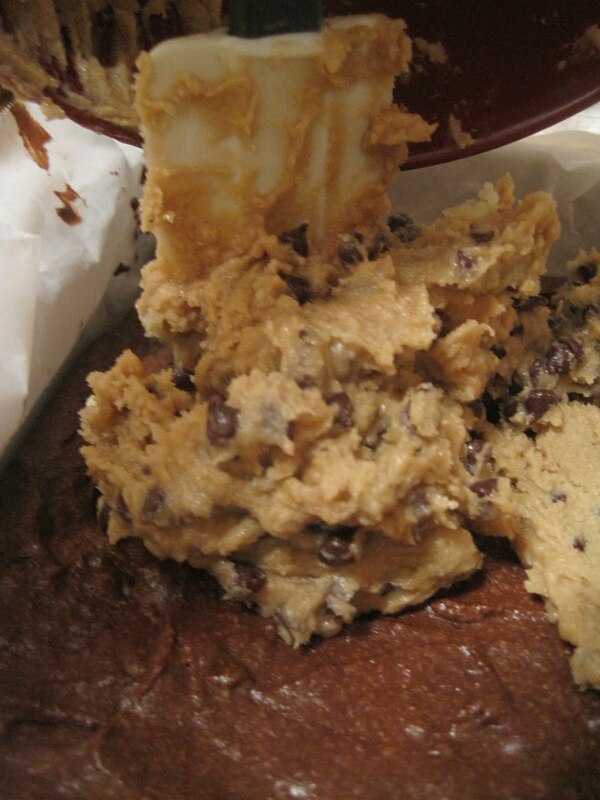 for this Chocolate Chip Cookie Dough Brownies recipe. Preheat oven to 325 F. Butter the bottom and sides of a 13×9 inch metal baking pan. Put a long piece of parchment paper in the bottom of the pan, letting the parchment extend up two sides of the pan and overhang slightly on both ends. (This will make it easy to remove the bars from the pan after they have baked.) Butter the parchment. 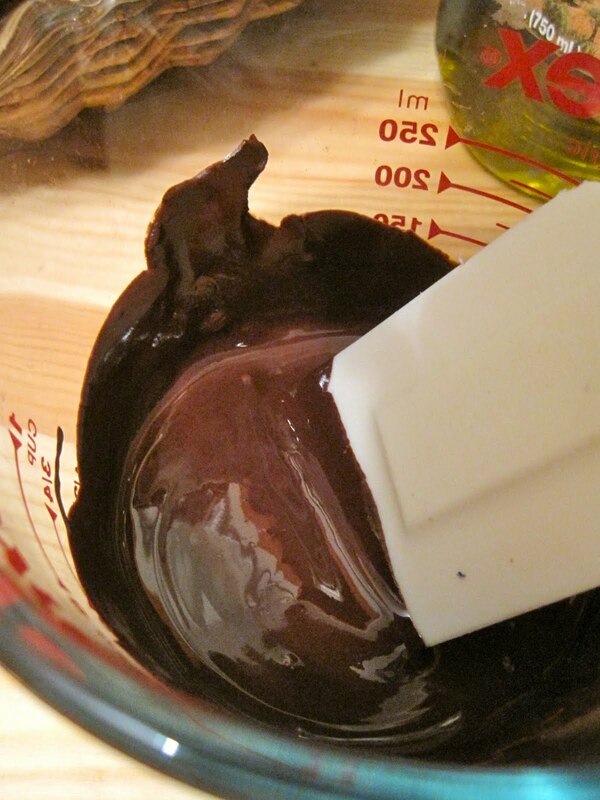 Place chocolate in a 1 cup glass measuring cup. Microwave for 1 minute and stir. Continue to microwave in 30 second increments until chocolate has completely melted; set aside to cool slightly. In the bowl of a stand mixer fitted with the paddle attachment, beat together butter and brown sugar until combined, about 2 minutes. Beat in eggs and vanilla extract until combined, about 30 seconds. Mix in melted chocolate until combined. Mix in flour mixture until just incorporated. Scrape batter into prepared pan and bake 25 to 35 minutes, or until toothpick inserted into the center comes out with just a few moist crumbs attached. Transfer pan to wire rack and cool completely. 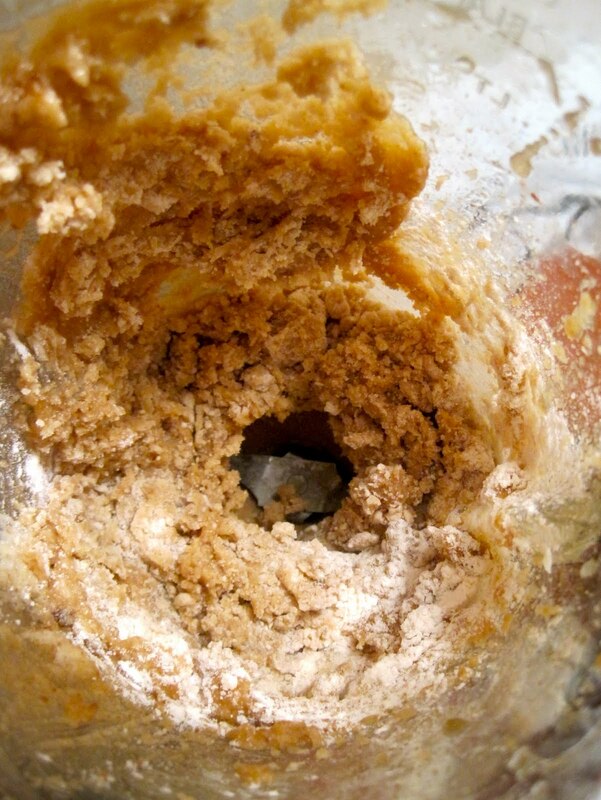 To make the cookie dough layer, In the bowl of a stand mixer fitted with the paddle attachment, beat together butter, brown sugar and white sugar until light and fluffy, about 3 minutes. Beat in milk and vanilla until combined, about 1 minute. Mix in flour just until combined. Stir in chocolate chips. Spread cookie dough over the cooled brownies. To make the chocolate ganache, heat semisweet chocolate and milk in the microwave for 30 seconds then stir. Continue to microwave in 15 second increments until smooth. Pour over cookie dough layer. Transfer pan to the refrigerator to let chocolate ganache set up completely.